Sound incredible? No doubt. For Jews in western (and Muslim) societies are be expected to know their place: to act maturely, responsibly and compassionately, to never fight fire with fire, to always understand the "other," to ever be ready to please, appease, and whenever necessary – turn the other cheek. Not so Israel's enemies. 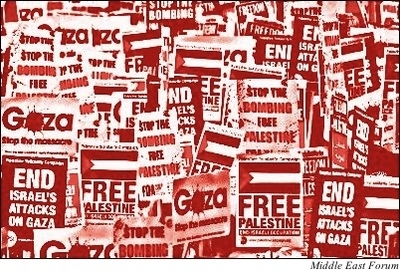 With a sickening unanimity that has become all too familiar over the past decades, whenever the Jewish state responded in strength to Palestinian terrorism – be it rocket attacks from Lebanon; West Bank-originated suicide bombing campaigns (euphemized as the Aqsa intifada); or rocket, missile and mortar attacks from the Gaza Strip – hordes of hateful, violent demonstrators flocked onto the streets of western cities throughout the world, not to call for peace or an end of violence on all sides but to demonize a sovereign democracy for daring to protect its citizens and to vilify and assault their own Jewish compatriots for no reason other than their different religious and/or ethnic identity. "Today, non-Israeli Jews feel themselves once again exposed to criticism and vulnerable to attack for things they didn't do," the late New York University professor Tony Judt lamented amid the growing number of hate fests in the early 2000s. "The increased incidence of attacks on Jews in Europe and elsewhere is primarily attributable to misdirected efforts, often by young Muslims, to get back at Israel." Neither did European Jew-haters await Israel's establishment to unleash on the remnants of the Holocaust. What makes this phenomenon particularly galling is that instead of clarifying in no uncertain terms the unacceptability of this bigotry in civilized societies, western elites have treated these recurrent hate fests as legitimate, if at times excessive, manifestations of Muslim solidarity with the Palestinians, thus providing a safe environment for outright anti-Semitic attitudes and behavior. (As evidenced by the ongoing bloodbaths in Syria and Iraq, the notion of Muslim solidarity is a myth, with far more Muslims killed throughout history by their co-religionists than by non-Muslims.) Just as western politicians and the media have ignored Hamas's indiscriminate missile attacks on Israeli civilians but jumped up and down over Israel's military response, so they have been bending over backward since 9/11 to embrace their Muslim citizens and to accommodate their perceived needs and sensitivities while remaining willfully blind to the fact that it is Jews, not Muslims, whose lives have been most adversely affected by increasing hostile attitudes on the ground – after all it is the Jews, not Muslims of Europe, who are emigrating in record numbers to find a safe haven. It is Jews who feel vulnerable to attack, and who have faced the most violence, and whose institutions from synagogues to community buildings to Jewish newspaper offices have been under heavy police guard for years, because of events in the Middle East – no Muslim community in the West has had to undertake similar security precautions. The truth of the matter is that since anti-Semites have never really distinguished among Zionists, Israelis and Jews (notwithstanding repeated protestations to the contrary), and since Israel is the world's only Jewish state, it has been tacitly construed as epitomizing the worst characteristics traditionally associated with Jews and has attracted the full brunt of anti-Jewish bigotry and hatred hitherto reserved for individuals and communities, not least because it has reversed the millenarian Jewish condition of dispersal, minority status and powerlessness. If prior to Israel's establishment Jews were despised because of their wretchedness and helplessness, they have hitherto been reviled because of their newly discovered physical and political empowerment. So much so that 66 years after its establishment by an internationally recognized act of self-determination, the Jewish state remains the only state in the world whose right to self-defense, indeed to national existence, is constantly challenged. In Lord Byron's memorable words: "The wild dove hath her nest, the fox his cove, mankind their country – Israel but the grave." The author is professor of Middle East and Mediterranean Studies at King's College London, a senior researcher at the Begin-Sadat Center for Strategic Studies and at the Middle East Forum, and the author most recently of Palestine Betrayed (Yale, 2010).